I have a National RS-770S 4-Track Reel-to-Reel "Stereophonic"
and I need to find out more about it! So I know National is Panasonic's old name. When was the RS-770S made? 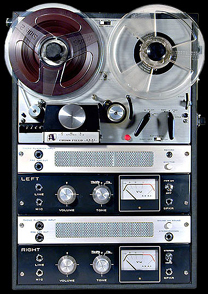 Availability of tapes for the 4-track? compared to 2-track and 8-track? Please post if you have any ideas about any of these questions or are in a similar situation or have a similar 4-track stereo tape deck. Does it look anything like this Roberts 770? Can give accurate price, but can start a ballpark at $40. Found one at goodwill this morning missing hinge pins and in somewhat good condition with a sticker price of $39.99. No reels or manuals. Hope this helps move you in the right direction.